N-Sync inc. Computer Services | Who is Responsible for Most Web Traffic? Home / Featured / Who is Responsible for Most Web Traffic? Who is Responsible for Most Web Traffic? 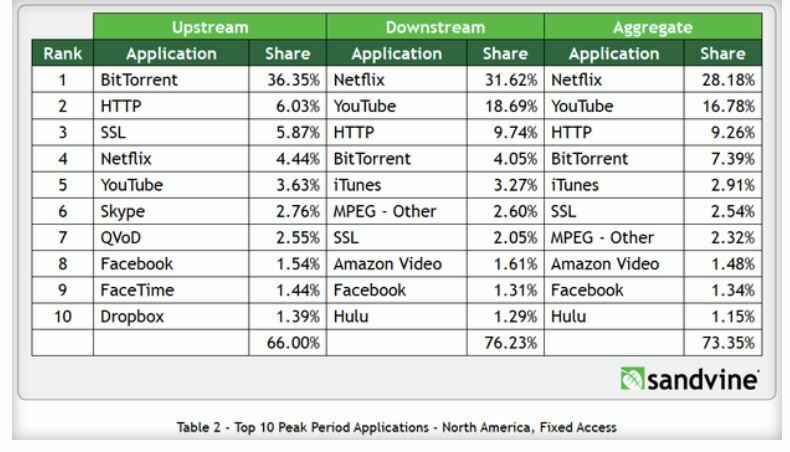 Today we came across a great article on Cnet.com (Link) with a chart that discusses what services use the most bandwidth, both up and downstream. If you simply look at the aggregate column you can see some interesting info. Netflix is responsible for 28.18% of web bandwidth (think traffic) and YouTube is 16.78%. So those two services Netflix and YouTube are accountable for basically 45% of all the traffic on the web! (In Simple terms). I was amazed to see that Facebook was only responsible for 1.15%, but then again, pictures of the baby and the cat, don’t take up anywhere near as much bandwidth as an HD movie. One other highly interesting quote discusses file sharing (think torrents aka “Limewire etc”) have really gone down.